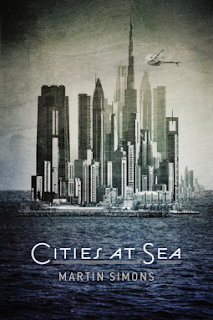 I picked up Cities at Sea by Martin Simons because I was very intrigued by the synopsis. It felt like a utopian version of the dystopia in Waterworld. Like many books I've read recently, my problems with Cities at Sea can be summed up very quickly: great idea, in need of either more writing skill or a stronger editor. The characters, the setting, the politics of the cities, the science, it all was a solid foundation. But none of it came together. The writing was very dry, and very technical when it didn't need to be. It felt almost like a science text, spending so much time explaining the hows of the cities themselves, the climate of their world, and the process of giving people gills. Instead, I think most readers would agree they want to know about the people and the conflicts. The characters themselves are all very flat, they don't come apart as individuals and they're constantly simply saying what they're thinking/feeling plainly and without much emotion. When a romance develops, it doesn't resonate or really do anything. A lot of time is spent on details that frankly just don't matter, and not enough time is devoted to things that are more intriguing and interesting. The summary of the book implies action that either doesn't take place, or is more of an afterthought, and those were some of the things that really should have taken center stage. All in all, the book felt like a first draft, where a writer was trying to get down the whats and hows of the plot, and tackle the worldbuilding challenge, but then they didn't go back and actually make it readable and interesting. I can't really recommend it. I was given a free preview copy of this book from NetGalley in exchange for my honest review. This book no longer appears to be available for purchase.